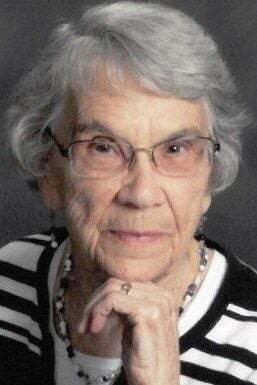 Margaret R. Krumenauer, 98, of Chippewa Falls died Tuesday, April 2, 2019, at the Chippewa Manor in Chippewa Falls. Margaret was born Nov. 10, 1920, in Chippewa Falls, the daughter of James and Rose (Harbich) Ryan. On June 15, 1938, Margaret married Tony C. Krumenauer at St. Bridget’s Catholic Church in the town of Seymour. She was a member of Holy Ghost Church. Margaret had worked as a dairy farmer and at the Holy Ghost Rectory for 25 years. Margaret is survived by two sons, Lyle (Joyce) Krumenauer of Chippewa Falls and Milton “Mickey” (Sandra) of Castle Pines, Colo.; one sister, Mary Jane Bourget of Cadott; five grandchildren, Denise (Gary) Axness, Kevin (Rhonda) Krumenauer, Michael (Kathrine) Krumenauer, Jodeen (Pat Sweet) Krumenauer and Troy (Jennifer) Krumenauer; eight great-grandchildren; and three great-great-grandchildren. Margaret was preceded in death by her husband, Tony, June 21, 1978; her parents; two brothers, Philip and Elmer Ryan; two sisters, Florence Krumenauer and Lucille Hall; and grandson-in-law, Dan Michels. Funeral services will be held at 12:30 p.m. Wednesday, April 10, at Holy Ghost Church in Chippewa Falls. The Very Rev. Justin Kizewski will be celebrant of the funeral Mass. Interment will be in Calvary Cemetery in Chippewa Falls. Friends may call from 4 p.m. until 7 p.m. Tuesday, April 9, and from 11 a.m. until noon Wednesday at the Horan Funeral Home in Chippewa Falls. There will be a Christian vigil service at 4 p.m. Tuesday at the funeral home.